I was on my way to a tweetup at Ottawa's Mill Street Brew Pub last night, when something suddenly dawned on me. My colleague pointed it out as I was leaving, but it didn't really sink in until I was three-quarters of the way there. "You're going to a bar to meet with strangers you met over the Internet??" she exclaimed, counting out everything wrong with that phrase on her elegant, manicured fingers. "Didn't your mother ever warn you about that?" Luckily, nothing went amiss - and I learned just how fun it can be to talk to strangers. And how quickly they can become friends. The Ottawa branch of the famous Toronto brewery has been packed and hopping ever since it opened in January of this year. Reservations are near-impossible to get, unless you plan a good month or two in advance. Now that I've been, it's easy to see why it's so popular. A lovingly restored old mill, original stone exterior with a sleek, modernized interior; a focused menu of drool-inducing, upscale and imaginative pub fare; and really, really, really good beer. Pungent aromas of hops and kitchen doings greet you at the door, as do the smiling, friendly staff. I grabbed a pint of Portage Ale at the bar and spent a few minutes tweeting my impressions until I was told others in the group had arrived. Ross Brown, a writer/novelist and host of the 'tweetup,' chaired the informal gathering of public servants, bloggers, academics, parents, a photographer and a former teacher (all of us wearing those same hats interchangeably, of course.) He twirped and chirped from his iPad while we all drank, ate, drank some more, ate some more and got to know each other. I saved the Coffee Porter for last, to go with a (reasonably portioned) slice of Dolce Vita, a layered cake of chocolate and espresso mousse that seamlessly complimented the beer, now rested at room temperature. Waves of coffee punctuated by bursts of dark chocolate ebbed and flowed over my palate. Beer with dessert? Yes please! Beer, much like wine, is best consumed in good company. Mere hours before the event, we didn't know each other. But by the end of the night, with many laughs and stories shared, new friendships were forged. We raised a glass on the success of the "tweetup" and departed with a promise to meet again for the next one. So your mom may still suggest you refrain from talking to strangers, but as @bs_ottawa put it, "If we are all drinking beer (together), we can't be all that strange!" 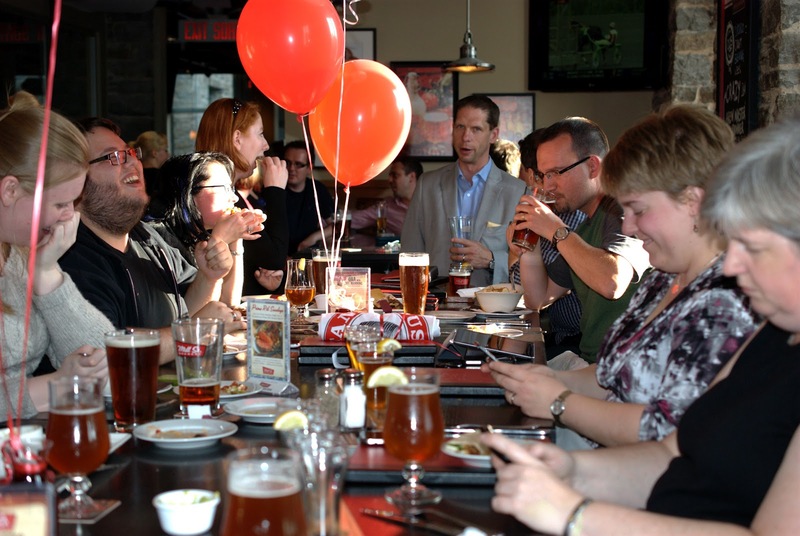 Follow #MillStreetTweetup and @MillStrBrewPubOT for future Twitter (and non-Twitter) events at their Lebreton Flats location.